You never know who you might bump into in Niagara Falls. 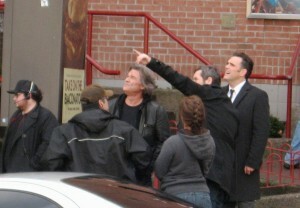 If you were milling about on Clifton Hill yesterday you might have just bumped into Kurt Russell and Matt Dillon on the film set of The Black Marks. Currently in production in and around Niagara and Southern Ontario, the cast and crew spent the day on Clifton Hill filming across from the Rainforest Cafe. The movie which also co-stars Canadian Jay Baruchel is a heist comedy and is directed by Jonathan Sobol who grew up in Niagara Falls.